Last month we travelled to Brisbane for Drinks With Chefs III to engage with some of the most talented and hard-working young chefs, bartenders and primary producers in Queensland's Great South East. This was the third Drinks With Chefs event hosted by celebrated chef Alanna Sapwell (Gerard's Bistro, Urbane, GOMA), who is utilising her platform to bring chefs, sommeliers and bartenders closer to conscientious primary producers. 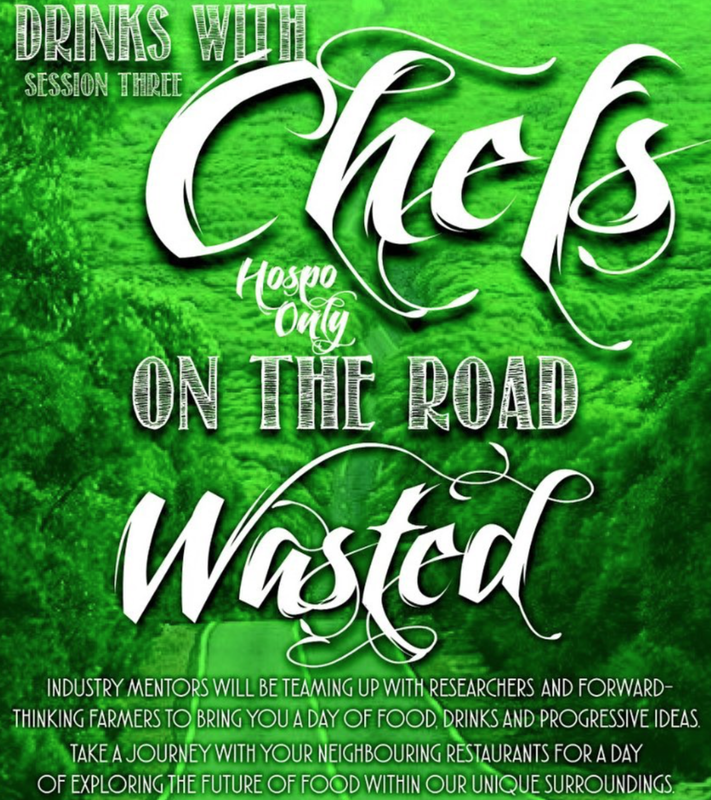 Each event highlights a different aspect of how we perceive, use, enjoy and monetise food. DWC III was about waste - asking questions such as how we can use the by-catch when fishing for targeted species, utilise runoff from farms to fertilise more farms, and what are the implications of transforming excess available carbohydrates into distilled spirits? Taking Hartshorn Distillery Sheep Whey Vodka north for the first time, was a brilliant opportunity to share our views on how distilling works to preserve energy and concentrate flavour. Meeting at Brisbane's dynamic Wandering Cooks, guests boarded a coach to an unknown destination and were immediately treated to young-ferment mead and a keynote speech from local apiarist Jack Stone of Bee One Third Neighbourhood Honey. Matthew Schmidt, Peachester Pastured Chicken. Following this, 12 guests were selected at random to go through to the restaurant, where an incredible four-course lunch was prepared by a team of generous chefs who donated their time to astonish and educate their peers. A huge thanks to Executive Chef of Stokehouse City Richard Dousby, Executive Chef at The Long Apron Cameron Matthews, Head Chef at Urbane Josh Raine, and local young-gun Mary Ann Dunn. Lunch was paired with a series of drinks that were crafted along the same theme. Elliot Pascoe (Cobbler) created something from nothing. The Bin-tang Blitz is a refreshing soda made by carbonating gin, wilted mint, sad-looking cucumber, green apple shavings and tarragon. A drink that truly showcased the versatility of his skill set and his command of the flavours in mixed drinks. Meanwhile, Ed Quatermass (Maker) went next-level, creating a dry yet creamy martini using Hartshorn Whey Vodka. For his garnish Ed ingeniously created a "fauxsciutto". A thinly shaved watermelon rind pressed with Säntis Trinity Peated Malt, Argalà Pastis and Fino Sherry – this made an incredible smoky, dry, chewy garnish that really looked the part. After presenting the Hartshorn Vodka to the diners, Angus Burton of Spirit People headed back outside to speak with the rest of the guests about the use of waste in distilling. When we're talking about spirits it's important to understand that we can create a delicious, intoxicating drink according to either a marketing plan or, instead, based on what we have available. Referring henceforth to the obviously more sustainable path, we can look back over the past millennium and see that distilling for beverages captured two distinct primary purposes: 1. Preserving energy, 2. Concentrating flavours and aromats. There are then two further follow-on effects of utilising this technology that we should be aware of, and that are hugely relevant: 1. Spirits are a concentrated intoxicant 2. Distilling can create distinct economic advantages for primary producers. We can see this in the products I have here with me today. The Grappa from Romano Levi is produced, according to heritage laws, only from grape marc that has already been pressed for wine making. The Hartshorn Vodka is produced exclusively from the whey byproduct of a cheesemaking process. In this sense, we have family-owned farms at an economically micro level, up-valuing their operations and safeguarding their livelihoods whilst minimising waste. For sustainability, there are huge implications here. Following on from this it becomes quickly apparent that in order to produce a fine spirit, we have to exclusively use the best ingredients, and I think we can all agree here that the best ingredients - the most vital, aromatic, nourishing raw ingredients - are seasonal, local, organic ingredients. Hence in the case of the Romano Levi grappa, the distillery exclusively uses top quality DOC/DOCG-designated grape marc from Barolo, Barbaresco, Alba, Asti...and the longevity of the traditional way of distilling here is guaranteed by virtue of the fact that people simply love the taste and aromatic intensity that the spirits concentrate into every bottle. To end the afternoon, guests were treated to a taste of Romano Levi Grappa, and the chance to toast their own Kirsty Mundt's marshmallows (so good!) around a fire pit before boarding the coach for a lively return trip and wrap of the day. A huge, huge thanks must go to Alanna Sapwell of Drinks With Chefs, and also to @table_brisbane for the use of the photos that have perfectly captured the great mood of the day.